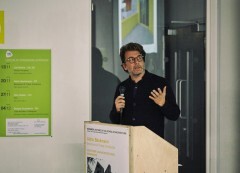 The second lecture on the theme of housing at UEL was delivered by Aldric Beckmann. Beckmann leads Beckmann N’Thépé Agency in Paris, a practice co-founded in 2002 with Françoise N’Thépé, which has since grown to a staff of 25. Beckmann has over 25 years’ experience working across housing, cultural, social and workplace projects both in France and internationally. Beckmann began by giving an overview of the housing landscape in France, giving contrast to the picture of housing in London, delivered in the first lecture. He highlighted the relatively slow evolution of housing in France, and the fast expansion of cities outside of Paris such as Bordeaux and Lille, in comparison to the capital where growth has halted. Beckmann explained the comparatively low onus on home owning in France and the large role of collective housing. The lecture was entitled: ‘Dichotomy: An Architectural Experience’ and Beckmann presented projects in pairs that represented opposing approaches, for example a subtle and low profile project, followed by a maverick one, with a strong and individualist response to its context. He used these dichotomies to highlight the importance of keeping an open mind in architecture with each new project. Beckmann opened with a slide of Corbusier’s La Maison du Fada in Marseille, which includes hotel and retail elements to create an active living environment, and praised this modern way of thinking about housing developments. The first own project that Beckmann presented was a shared housing complex that completed in 2007 in the Massena district, a relatively deprived area of Paris. Beckmann described breaking the complex into units ranging between six and twelve storeys and creating a composition of balconies, in order to fragment the form, and fight against the scale of the complex. He also highlighted the importance of the two large shared roof terraces, designed in response to the lack of surrounding parkland and green spaces, and the deep sense of satisfaction he gained returning to these shared spaces and meeting residents today. The complex, which is build from brown tinted concrete, highlighted in gold leaf on selected sides to attract sunlight, is distinctive in its aesthetic and has received much coverage in the architecture press. 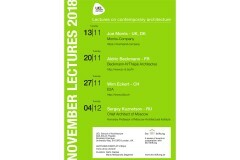 Beckmann went on to present a number of housing projects currently in progress by the practice, ranging in scale from a new-build, large-scale housing project in the Rosenhugel district of Vienna, Austria, to the restructuring and creation of a small-scale housing development on Rue Leon Frot in Paris. Throughout, Beckmann highlighted the important of responding creatively to the context and history of each site, and staying mindful of the clients’ desires. In presenting the larger developments he described playfulness with scale, height, space and light, and the importance of transparent, open, public spaces that help people to live together. He also illustrated the creative use of architectural elements including columns, balconies, colour, sculptural features and foliage to diversify and disperse building mass. 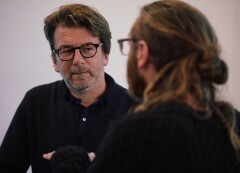 Above all he talked about the importance of generating meaningful new forms, and offering a generosity of space. Beckmann credited his background, living in both Marseille, with its strong architectural landscape, and the countryside, with the pleasure of light and the natural landscape, with allowing him to appreciate the contrast, and importance of both. He explained how painting, abstract art, writing and philosophy personally inform his work. Beckmann also credited the influence of British architect Will Alsop, whom he worked under for a number of years, on his work, and on his pursuit of creative freedom within architecture. 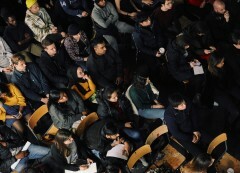 He willed students to continue to think and talk about architecture, and to continue sharing with each other, especially in the age of the computer screen.